Boho beautiful, the free-spirited presence of the Key West Flower Power House has much more in common with the real Key West than the shiny hotels around town. Kindred to memories we share about ‘the good old days,’ this 1938 wooden house was first renovated by unconventional ‘hippy builders’ in the 1970’s who were creatively rethinking the use of space of Old Town wooden dwellings, around the same time the first street buskers where inventing the Sunset Celebration at Mallory Square. Breaking down barriers between indoors and out, nearly every room received French doors so architectural design labels of mid-century modern or Key West Victorian, a spacious living room was added, with soaring ceilings and transom windows that rise clear to the roof peak. Refusing to be limited by stultifying design, original glassed in porches became alternative sleeping spaces, while the adjoining carriage house became a whimsical seashell cottage. Decades after the hippy and military days of Key West, our company continues to watch this house be re-invented by artistic owners who’ve added their own sense of bohemian flair, embracing an eclectic mix of new with old, reflecting a love for island art and the Caribbean Sea. Nothing boxy or modular, no-way modern-flat pack style anyway anywhere. Informal island comfort is presented with a love of tropical color, a down-home style that celebrates the beauty of nature and what’s naturally imperfect. To sum it up, our Flower Power House harkens back to what Key West still means for many – anti-style, freedom from convention, an occasional gypsy chicken mingling with guests in the garden. Interior Layout: Ultimately, the house was reconfigured to offer three separate areas that are joined together as one. The ground level, at the front of the house, features a spacious living room, with cathedral ceilings and connecting fully equipped kitchen. Here we also find two bedrooms and two bathrooms. The 1st bedroom offers a king size bed and the 2nd bedroom a queen size bed. French doors open to the porch in both of these bedrooms. Accessed through bedroom two with a doorway for privacy, is a sleeping porch. Set with two twin beds, it adequately functions as a 3rd bedroom and is ideal for children sleeping close by. A 4th and 5th bedroom, one full bathroom, a galley kitchen, and sitting room and are found on the 2nd floor, which is accessed via an exterior staircase. A split floor plan provides maximum privacy with a master bedroom with a glassed in porch and king size bed on one side of the house, and two twin beds with a window view to the pool on the opposite end. Back downstairs, and connected at the back of the house is the adorable 1.5 story 6th bedroom. Set in the artist-owner's cute re-design of the carriage house, this is an intimate boho space that was once featured in Coastal Magazine. Exterior French doors connect with the garden in the back and front. With a sense of playfulness, stucco pastel faux painted walls inside form a colorful creamy backdrop for a flamboyant adornment of sea shells like icing on a cake. Open beam ceilings on the main level plus a kitchenette and a comfy sitting area set with shabby chic finds, make the cottage suite feel larger than it is. A bunk in the corner provides an extra sleeping space if you need it. A short hall-way stairwell leads to the half-story 2nd level sleeping space with a king size bed and a one-of-a-kind witty ‘she-sells-sea-shells’ theme bathroom. Definitely tropical and different than what we live with day-to-day, this space is an artists’ boho love nest. French doors off the back open to the garden to create a little private sitting space steps from the rest of the house. Exterior Layout: This house is part of a private gated mini-compound set back from the street. Covered porches that run the entire length of the house maximize the opportunity for indoor-outdoor living. Step down off the porches to the large landscaped garden and just beyond enjoy a 40’ X 16’ swimming pool (no heat) and more gardens ample for lounging. Outdoor furniture is place for lounging on the porches and around the pool. A little piece of old Key West, not too shiny, no-way modern sterile. Amenities: Spacious tropical garden. Large 40' X 16' feet swimming pool (no heat, shared with another property, A Tropical Tradition, if they are rented at the same time). TV's, a/c, stereo, phone, washer dryer, linens and towels provided, fenced yard, large porches, two kitchens plus kitchenette. Activities: Conveniently located to grocery shopping, art galleries, restaurants, and deli restaurant and bakery. Close to the beach (a short walk), favorite Salute Restaurant on the Beach, parks, Key West Wildlife Center. Ride your bike to Duval Street and the southernmost point of the U.S. in less than five minutes. Walk to Duval Street in 20 minutes. See this favorites list of Things to Do in Key West for more recommended activities. 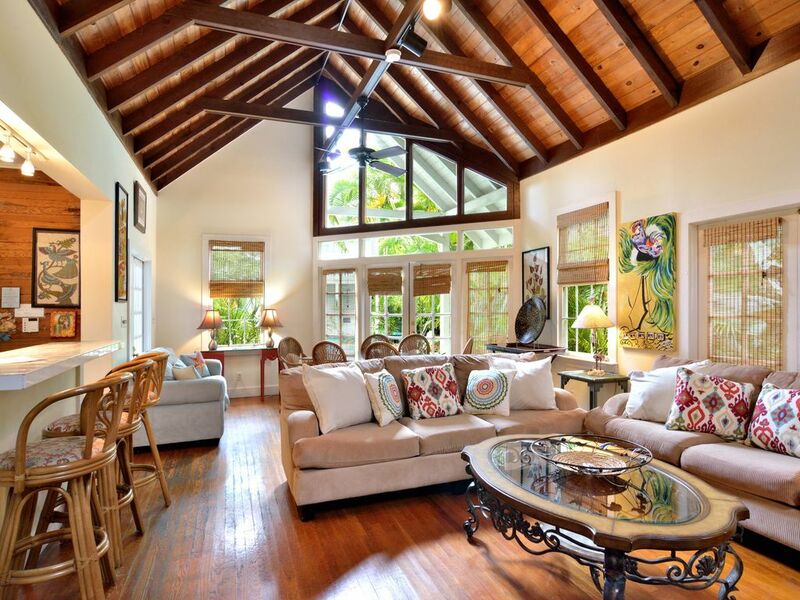 Area: This home is ideally located in the White Street Gallery neighborhood of Old Town Key West in a historic neighborhood just a few streets from White Street and Higgs Beach. Play beach volleyball, rent hobi-cat sail boats, swim, snorkel, swim, fish, from the White Street Pier. From this location you can quickly walk to the famous beach restaurant, Salute on the Beach, Fausto's Fine Food Palace (fine wine, cheeses, and gourmet foods), Sandy's Cafe of Cuban coffee, numerous art galleries (White Street Gallery area), and yoga and exercise studios. Duval Street shops, attractions, and the Historic Seaport District is a ten minute walk. Restrictions: Smoking permitted only outside please.